This week, Philadelphia’s amended “Fair Criminal Records Screening Standards Ordinance” went into effect, continuing the trend of ban the box laws that are in effect around the country. 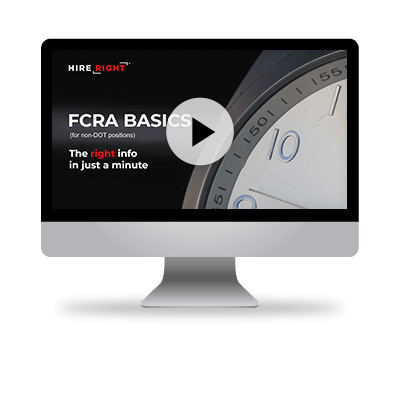 This video spotlights a variety of factors that greatly influence how quickly a thorough pre-employment background check may take, along with some tips on how you can help prepare your job candidates to help expedite the process. Can My Company Benefit From Utilizing Hair as a Drug Testing Specimen? A drug free workplace is not only likely a safer environment, but it can be more productive. Hair testing has big advantages over urine testing, when it comes to laboratory positive detection rates, because there is a significant increase in the detection window with hair testing. Your job candidates may be consumed with any number of fears about undergoing an employment background check that can make the entire process unpleasant or even downright terrifying. Talent acquisition professionals can actually help address these fears by understanding the common concerns many candidates have regarding an employment background check, the misconceptions that often underlie these concerns, and the best way to address them to better ensure a calmer, more positive hiring experience for everyone. Is Your Hiring Process Evolving with the 2016 Changes? In the past year, many companies have seen their workforce’s grow. Unemployment rates continue to decrease as we enter the New Year, which means continued competition to hire top talent. Acknowledging changes and challenges to the employment landscape are key to making sure that your workforce grows successfully in 2016.